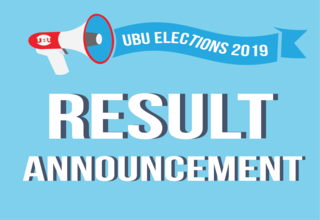 UBU are pleased to announce the successful candidates who will take on senior leadership roles in the Union for the 2019-2020 academic year. During our elections 1141 students cast their votes, with the following individuals receiving the most votes to take on their respective roles. We would like to thank all of our nine candidates for representing the Union with their exemplary conduct during the election period. We have been very impressed with the passion, ideas, and ambitions our candidates have had to ensure their Union continues to be relevant, progressive, and representative of our student body. The new team can look forward to working with a new Vice Chancellor, Professor Shirley Congdon, who will shortly take on her new role. We are confident that the Unions new student leaders can look forward to working together with the institutions new leadership team. Whilst the University welcomes the first female Vice Chancellor, the Union also looks forward to having our first ever female Student Affairs Officer. These are exciting times for both our organisations, and demonstrate our commitment to equality, and diversity in leadership. I know that I and other members of the outgoing team look forward to working with the new team during the handover period in June. Can we take this time to thank the student body for their support during our terms, and in the months that remain.